The purpose of publishing newsletter is to update the members of CREDAI (Confederation of Real Estate Developers Association of India) which was previously known as PBAP (Promoters and Builders Association of India), the old Builders with whom we are already working in collaboration, the new builders as well as the Other N.G.Os about Center for Laborers’ Children activities. This newsletter is published in English once in three months. Awakening Jagriti is publishing newsletter for teachers from the last three years. It is being published and distributed across Pune, Velhe, Nashik and Nagarcoil region once in three months. The aim of teacher’s newsletter is to reach all the teachers of the sponsored schools and to create a common platform for teacher to share their knowledge, ideas and skills. It makes them aware about updates and latest information in the field of education. This will in turn help them to improve their teaching methods. The newsletter consist of the information related to syllabus, psychological aspects of children, stress management, class management, activities carried out by Intervida and information of government schemes related to education. The manual is a booklet for teacher’s reference. The manual contains information on using counseling skills to assist students in overcoming social, personal, and academic barriers. The teachers will be aided to identify children with various behavioral problems, and checklists to determine isl be provided. Along with this, the list of all referral agencies, their addresses, contact person, phone numbers and brief description of the services offered by them is provided. This will help them to refer cases once they identify children who are in need of help. All these is easy to use and is written in simple language for practical uses. Child counsel is a journal designed specially for the children of 5th, 6th and 7th standard in a child friendly language. Monthly record of child council is maintained by the children in this journal. The journal contains pictures, educational information, games, puzzles and daily recordings of their work. The front cover of the journal denoted the group of the child to which he belongs. Tachan book is a dairy designed for the teachers of our sponsored schools to maintain daily record of their teaching and lesson planning. We distributed teacher’s log book to all 1st to 7th std. teachers under teacher’s package. This newsletter is published at the end of the year. The basic purpose behind this newsletter is to motivate children for active participation in child council activity. Achievements of the children who had taken active participation in child council activities are published through newsletter. It includes remarkable work, experiences articles, success stories, drawings and poems are collected and published. Bharari is an activity book which includes information regarding festivals. Important days, child rights, poems, puzzles, general knowledge and moral stories. It was also used for Child council activity. It is a guidance book of children to understand their roles and responsibilities in child council. It gains knowledge of children through entertainment. Palavi is a child friendly magazine designed for the children. 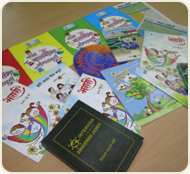 Articles, drawing, stories etc are collected from the children of our sponsored schools and are published in this book. To enhance artistic qualities of the children is basic aim behind this magazine. Arogya Savangadi – This publication of ours is for school health committee leaders. This is used to monitor the cleanliness levels and personal hygiene of the group members of the health committee. Information in form of pictorial representation related to nutrition, balanced diet, general cleanliness, environment and sanitation are provided to the group leaders in a child friendly manner. Prathomopchar – this manual is for teachers where information related to first aid is provided. Prior training to teachers was given on this manual. Growth Monitoring card – this is used by Community health worker to monitor the growth of children from 0-3 years in the community. 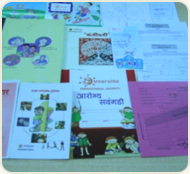 Sanjivani – this manual is for the village health guides. This is a register to monitor the general health of the villagers. This helps to keep a record of the general medicines that are given to them. Aarogyachi Pahat – this is for 5th – 7th standard students. This activity sheet is used during health screening process. This has information related to balanced diet, first aid and introduction to internal organs in human beings. Health screening cards – are meant for 1st -7th standard students. It is used by doctors as a check list to examine the general healthy of students. Vaccination card – this card is used by the doctors for 1st -7th standard children to know their immunization status. The cards are filled by their parents. Surveillance register is used by CHWs in communities to monitor the general and reproductive health status of women in the reproductive age. Child health from 0-3 years is also taken care of. Community Health Worker conducts daily home visits and fills the register. Educational Program for the children of construction labourers ( EPCCL) is a project which works with children of construction labourers. The department was started in the year 2001, during the first year of operations we were running only 1 school with 20 children. Presently our program has expanded to more than 37 activity centres which are reaching out to more than 1500 children. The construction industry is the second largest employer of man power in India, most of the construction activity takes places in metros and major cities in India. Pune in the recent years has become a hub for construction and there has been a lot of demand for skilled and unskilled manpower. Most of the work undertaken at construction sites does not require any specialized skills. are poor and they have been migrating to the cities to look for viable economic ventures. The construction industry with its large need for unskilled manpower has been attracting most of the migrants from rural and interior parts of central India. The living conditions across most of the sites are poor; some of the major concerns are lack of provisions for safety and complete lack of developmental facilities for children. Moreover the parents see their stay in the construction site as transitionary and do not take any steps to improve their own quality of life. In our experience we have seen that people continue to be a part of the construction site for a really long time thereby depriving their children of educational and developmental facilities. Recognizing such needs of children a recent ruling by the government has made provision of crèches compulsory. While it is encouraging to note that at present more than 25 builders are running crèches at their construction sites, it is also alarming to note that there are more than 500 construction sites in Pune where there are no crèches. Fundacion Intervida is an international NGO with its head quarters in the country of Spain, Intervida works in 22 countries across the globe. Intervida in India works across 5 geographic locations (Pune, Velhe, Nashik, Girnare and Nagercoil). Majority of the funds raised by Intervida are through a system of sponsorship and project contributions from organizations. Intervida’s projects aim at upliftment and development of communities and its residents, especially children. We follow a system of multisector intervention to achieve our objective of “Improvement of quality of life”. We have five core sectors of education, health, economic development, people participation and child rights; the sector of gender, environment and food security are transversal in nature. Through these sectors, we promote a model of indigenous development based on the criterion of participation, respect for local cultures, integrity and sustainability. 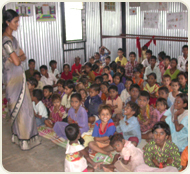 Intervida’s projects reach out to more than 1.5 lakhs children and a total of over 1.8 lakhs beneficiaries directly. A staff of over 240 professionals from the field of social work, education, psychology, sociology, special education and medicine are working diligently towards attainment of our goals. Our work in India is focused on improving the life conditions of thousands of children by building their capacities and providing them with opportunities for better future. We have also been active in extending our support during natural calamities. We have been involved in relief and rehabilitation during Gujarat Earthquake 2002, Tsunami and Kashmir Earthquake 2005.